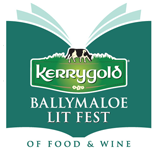 Darina Allen: LitFest 2014... just around the corner. WIN TICKETS! Would absolutely love to win tickets to this! The event I'd like to go to most would be The Food of the Middle East - sounds so interesting. And the food hero I'd most like to meet would be Jamie Oliver. His enthusiasm for good food has really helped changed peoples' perceptions about what they eat and where they get their produce from. Would love to win tickets to the Rachel Allen/Ross Lewis and the food and Wine Blogging events! Food hero? Impossible to pick between Myrtle Allen/Theodora Fitzgibbon and Keith Floyd... Three great champions of Irish Food at times when it wasn't trendy to be so!!! I would like to win tickets to the Food and Wine Blogging event. Although not at the festival, I would most like to meet Antonio Carluccio. I love his charm and relaxed personality but most of all his excitement for, and love of, great simple food. I'm a blogger, I have mentioned Rachel Allen in many of my posts as inspiration! I'd love to attend the food and wine blogging event. I would love to win a ticket to the Diana Kennedy event. I once in a lifetime opportunity for me. Fats, because this topic continues to baffle me. And Darina because the last couple of times we met she was very distracted! I would love to attend Food and Wine Blogging and I would love to meet Ariana Bundy. My husband is Persian and I have a huge interest in his super healthy tasty food. And the winners are Niamh Mannion for the blogging and MyFavouriteThings for the fats talk.